I’m sure you’ve heard the old adage, “Don’t judge a book by its cover,” but let’s face it–to some extent, we all do. People, colors, fonts can all catch a reader’s interest, or cause them to pass right on by. I envy self-published authors, who have the opportunity to create a cover that represents precisely what they would like to see. They also have the ability to change the cover if it doesn’t sell well for them. How exciting! As a traditionally published author writing for Harlequin, I don’t have that luxury. At the beginning stage, Harlequin asks for my input in the form of an Art Fact Sheet, which includes theme, synopsis, characters and my thoughts on potential scenes. Then editorial and the art department get together and create a concept for the cover. They hire the cover models and shoot the scenes. The art department is fantastic and generally does a wonderful job, but I, as the author, don’t get to see my cover until it is nearly finalized. Up until recently I didn’t see my cover at all until it was already completely locked in, so I was happy when they recently started sending me a mock-up of each cover near the end of the process. I now have the opportunity to suggest small changes or point out glaring errors. In the past I’ve noticed issues with a saddle or the exact color of my hero’s eyes, which the art department has or has not chosen to address. But with The Cowboy’s Twins, coming out April 20th, I had a much larger problem. I was definitely glad to have the opportunity to see the cover before it was finalized. 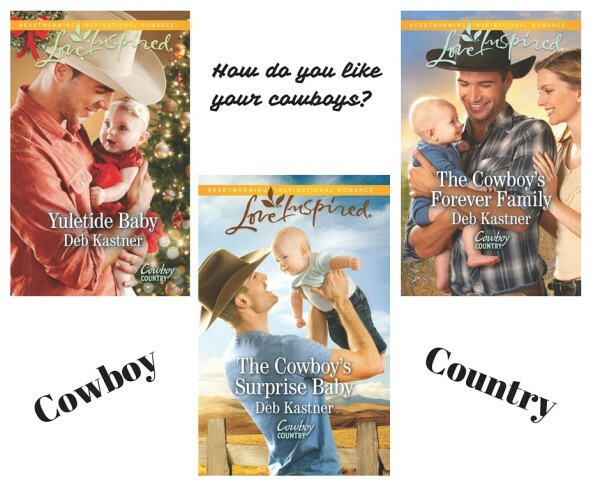 I am super blessed that Love Inspired has branded my books to be close-ups of handsome cowboys and delightful babies. I’ve always preferred having people on my cover, and I especially like the close-ups. Most of the time they are fairly similar to how I imagine the cover. However, with The Cowboy’s Twins, we had a little hiccup. So what happened? 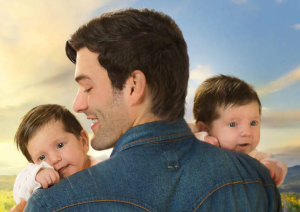 My hero held his twins against his broad shoulders and looked down at one baby, exposing—you guessed it—the left side of his face. The babies were adorable with their thick dark hair and I loved the concept, but it was a pretty major error and I knew it would bother readers as much as it bothered me. Fortunately, the art department was able to mirror-image my hero so on the final cover he is now looking to his right. However, when they mirror-imaged Jax, the babies no longer worked. They were now gazing the wrong direction and were throwing the whole picture off. So, as cute as those babies were, they had to be photo-shopped. Happily, I am completely in love with this new set of twins, so it all worked out perfectly, and I’m proud to have my name on the cover. So there you have it. One Harlequin author’s experience with cover creation. 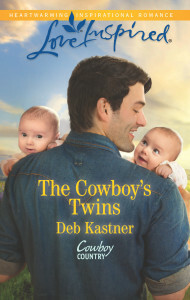 What do you think of The Cowboy’s Twins cover? Do you judge a book by its cover, or do you buy books for other reasons? Comment below for your chance to win an autographed copy of The Cowboy’s Twins. Yikes! I’m happy the cover design crew were able to make the fix, Deb. The cover looks great! I particularly like the baby on the right…cute smile. The twins in my book have different personalities, so I immediately knew which one was which on the cover. Charming cover! And yes I do notice covers and sometimes judge by them. If a bare chested man is on the cover I probably won’t even read what it’s about. If the cover catches my eye I will stop and read what it’s about. One of my recent favorites is A Twist of Faith by Pepper Basham. I can’t help but smile every time I look at it. You just have to wonder what the heroine on Pepper’s cover is smiling about, don’t you? And I agree about the shirtless men. Interestingly enough, Harlequin put my cover up against several others, including the shirtless guys, and my cover got more votes–so I think there are a lot of women who believe less is more. I do pay attention to covers. One thing I really don’t like about many covers at the moment is that the head of the person is chopped off. I want to see the face. Those babies sure are cute! I don’t get that, either, Beth. I want to see the face!!! But I’ve been told it is so the reader can imagine what the face looks like. Me? Not so much. As a reader and retired creative writing and journalism teacher, I am always interested in reading about the publishing process. Your cover is appealing and inviting. As a reader, I unfortunately judge a book by its cover and title. A conservative, sunny, well designed cover catches my interest, then I read the blurb, followed by a the story. While I am aware that not all authors have the opportunity for input on their book’s cover, a well designed cover shows the reader the author cares about the quality of their story and book. Titles are the other iffy thing with Harlequin series books. We submit a list, but ultimately they create the title. I like your finished covers. Now I understand why pictures don’t always match the story! I assumed the author had a lot more input. I do love clean cowboy stories, but I tend to judge it by the cover. If a cover is too “sensational”, I pass it by. Many authors have more input, especially self-published authors. That’s why there are so many spectacular covers coming ’round. I try not to judge the book by its cover (sometimes a really dull cover turns out as a really good book) and instead judge it based on reviews (I read the best and the worse reviews always). Of course I’m completely blind to both cover and reviews when I really like the author (sometimes I skip the blurb too, I just buy it and figure out what it was all about later when I’m about to read it–most authors on this blog go into that category actually, which is why I’ve been following lately). However I have to admit that (like previous comments), I won’t buy a book with a picture I’m not comfortable sharing with friends and family (e.g., naked, bare chests). I probably won’t like the book either. Reviews are extremely important to authors for that very reason. I appreciate anyone who takes the time to post what they thought of my book so others have an idea of whether or not they would like it, too. I like the cover. Sometimes I do decide to pick up a book to look at by looking at the cover, but not often. The library typically only shows the spine! Glad you were able to fix your cover as it does bother me when facts don’t match the cover. Our small library bunches the inspirational romances together so at least I know where to look. We authors always think we know what’s best–but I appreciate the Harlequin art department for the great covers they’ve been putting out, especially in the Love Inspired lines. How can anyone resist twin babies and a cowboy! I used to think I didn’t pay attention to the cover when selecting a book but have realized that I DO judge a book by it’s cover! For a long time they were at Harlequin, too, Kimberly. I am glad they give us a “sneak peek” now. I love insights into the process. I really like your covers. Glad you were able to get the scar problem fixed. It’s always really annoying when covers and illustrations don’t match the text. A long time ago I had a cover–The Christmas Groom–that was to die for. The Navy guy was drop dead gorgeous–and he had black hair. Which was a bit problematic, since the hero in the book was a bleach blond. Deb, you go, girl! Stick to your guns and congrats on the new release. :) I always remember the one reader who wrote to me on FB about my Love So Amazing cover. She asked me how in the world I was able to find models who looked just like my characters. Wink. Blessings! Most of the time I’m really happy, even with errors, but there have been a few occasions where I cried when I saw the cover. I always look at the cover ,so when I read the story I can picture them with my mind’s eye. Those dark-haired twins remind me of my daughter and granddaughter when they were babies. I’m always a bit partial to that look! But yes, you have to do what matches the story best, and I’m glad you were able to get the photo flipped, even if those twins had to go! My daughter is doing some photo shoots for an upcoming series of mine. The first book is written, so that heroine is ‘set in stone’ in my mind. But the other two aren’t, so I can easily write the story to match the photo! It’s fun to have that option, too..
How cool to have your daughter doing the photo shoot for you. Talk about being able to get exactly what you want! I do pay attention to the covers but realize that the authors do not always have a say. The blurbs on the back cover do more to catch my attention. I also read the first couple of pages to see if it captures my interest. I totally am attracted to a cover that appeals to me. When I’m in a store and scanning thru the books, I will always pick up a book that has an attractive cover. I really like the cover of your new book. The cowboy is handsome and the twins are really cute. I am a fan of cowboy romances. I can’t wait to read your book. Gentle Giant cowboys vulnerable little babies. The perfect combination! Nice catch on the scar! Those are things that drive me crazy. And why can’t they include scars, anyway? Don’t they realize it makes the characters more relatable? Pretty covers draw my attention, but if the back cover copy or the content of the book doesn’t hold up to snuff, that cover isn’t going to make me keep the book. I totally believe that the cover of a book can make it or break it. A good cover is very important. I will read about a book and look at the cover, then put it back if I am not impressed with the cover! I’ve totally done that too, Lori! I guess cover art carries such weight with us because of the aesthetic value. Most people tend to be drawn to pretty things, I think (each of us are drawn to our own perceptions of “pretty”). I remember one particular time, though I don’t recall the book, when I read the back cover copy and was excited to read the book, then looked at the cover and felt disappointed that the artwork didn’t meet my expectations… before I’d even read a single page within the book! Pretty sure I didn’t buy that one, but it could have been more a budget issue at the time. I’m with you, Andrea, on the scar. I guess they want the heroes to look “perfect.” I’m intrigued by scars, hence my obsession with Phantom of the Opera and Beauty and the Beast themes. One interesting thing is that as an author, what one reader will think is a “gorgeous cowboy” is just “meh” to me. And vice versa. And then there’s hair color, eye color, etc. I love covers and blurbs. I love how the adorable baby is smiling and looking up at the cowboy. Since I read e-books I am more interested in reading what the book is all about. When I bought books in stores I paid more attention to the covers. Glad you had input and the cover was corrected before it was published. I love how the babies have such different personalities, just as I described them in the book! Glad to see they were able to use the magic of Photoshop to correct the problem. Me too! It was actually their idea to mirror image him. I have zero skill in that area. It’s true, the cover matters! Glad your publisher worked that one out! Thanks for the chance to win! I love the cover!! I’m such a sucker for twin babies!! A book cover definitely influences my interest in a book, but then I also factor in the description and the author before I make my decision to purchase it. I have limited reading time so I do buy a lot by author. But covers are also a big thing to me. A book cover also influences me to pick up a book at random.. great cover by the way. There are times when visit my local library and pick up a book(or two) to read based on the cover.. it DOES have to capture my attention though. Interesting (from my standpoint as an author and how much control I have or don’t have over various parts of it) how it all comes together to make sale. I’m a firm believer in writing every book the best I can and make readers from those who want to read another book with my name on it. I don’t refuse a book because I don’t like the cover. I’ve discovered that there are some pretty wonderful books out there though they might have a lackluster cover. I will say that, at the same time, I love a good cover and there’s a certain style that catches my eye and there have been many books that immediately caught my eye because of the cover and I loved them. Good point! A wonderful book may be hidden behind an awful cover. It’s just getting to that point where I’ll read the book in the first place. It does drive me crazy when I am reading a book and the people on the front don’t match the descriptions in the book! I do love a good cover….there have been some gorgeous ones come out lately! It certainly factors into me wanting the book but that’s not all. Author, back blurb, storyline, not necessarily in that order! LI of any kind are pretty much guaranteed to be picked up by me regardless of the author. And the ultimate deciding factor for me, it must be Christian! I don’t read “clean reads” because they are missing the most important key element for me…..faith (God). I love a good Christian book where I feel like I’ve learned a lesson or grown somehow in my faith or been encouraged. I feel so blessed to be able to write faith as a natural part of the story–because in my own life I can’t separate my faith from who I am as a person. Hi Deb, The twins with their daddy are adorable :) Thanks for sharing the cover design process with us. Yes, I definitely appreciate a good cover.. Great covers here!